Neighborhood block parties will be held citywide on Tuesday, October 16, 2018. 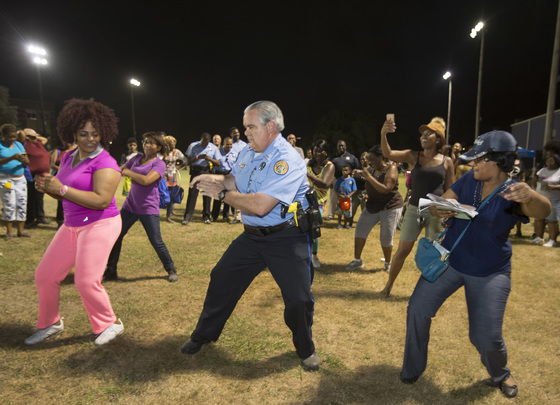 The NOPD is preparing for the 35th Annual Kelly Marrione National Night Out Against Crime on Tuesday, October 16, 2018. Superintendent Michael Harrison is encouraging all community members to host a neighborhood block party to raise awareness of best-practices for preventing and reporting crime. The 2018 Night Out Against Crime Kick-off event will take place at 5 p.m. at A.L. Davis Park, at 2600 Lasalle Street. Representatives from local, state and federal law enforcement agencies, as well as city officials and neighborhood organization will be in attendance to provide resources, family-friendly activities and interact with residents. Residents, businesses and community organizations can register their parties for free with the NOPD online at https://www.nola.gov/nopd/night-out/. Chief Harrison and the NOPD Commanders for each district will be moving between events throughout the night, reaching out to the community and thanking them for their support. Organizers requesting barricades should make requests here. All public sites must be pre-approved for use by the individual agency that manages the site before they are registered with the NOPD. Example: Any parties being hosted at a NORDC facility, must be approved by NORDC. Location: A.L. Davis Park – 2600 La Salle St. Location: 1101 S. Gayoso St. Location: 1100 S. Tonti St. Location: S. Miro & S. Tonti st. Location: Jerusalem Church – 3802 Martin Luther King Blvd. Posted in Crime, Orleans-East Bank, Orleans-West Bank.